Because good girls "don't really have a sweet tooth" and I eat chocolate by the pound. Say something. Okay, I didn't intentionally lie. But, I forgot one caveat in my last post. 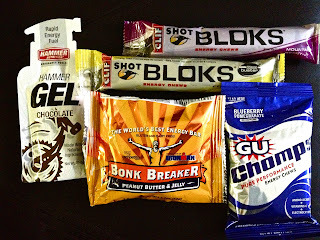 Since I'm doing endurance training for my half marathon, I have to consume some packaged foods, namely high carb "food". 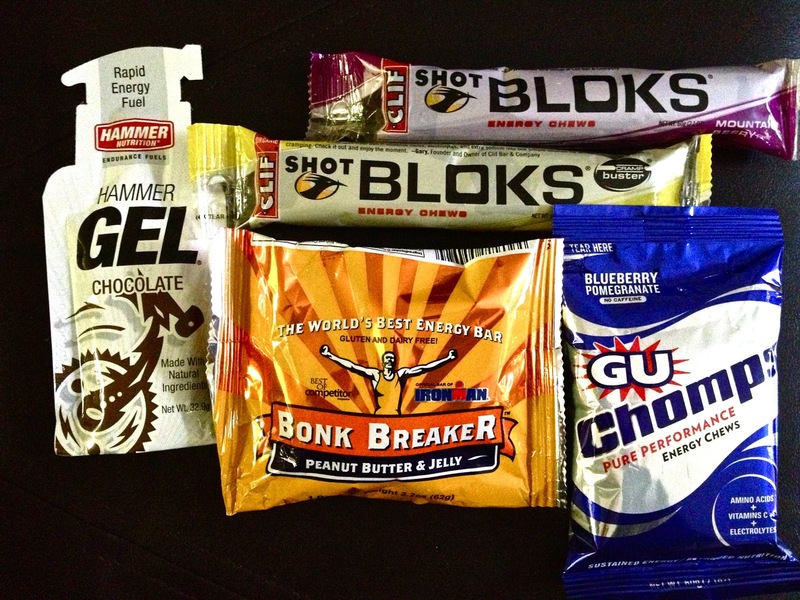 Things like this mostly come in the form of gels, gummy chews, or jelly beans. Since I'm beginning to do runs that last longer than an hour, I actually have to refuel mid-run. Anyone out there used any of these? What are your favs? I did my first double digit training run yesterday -- 10 miles. It was only slightly uncomfortable, but I made it through unscathed. I ate a Peanut Butter Gu. Which, surprisingly, did not taste great since I put it in my bra for the first 5 miles, so it was hot and I was hot and that is not a satisfying combination. I'll just carry it next time. Warm peanut butter is not refreshing when you're sweating balls. Who knew? Speaking of peanut butter, you should all know right now that there is a recurring theme to my life as it relates to food. That theme is peanut butter & jelly. I LOVE PB&J. Although I've made the switch to almond butter, I still enjoy some jelly with it. 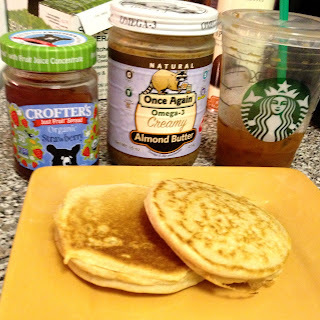 Almond butter and peanut butter are synonymous to me. Both delicious. PEANUT BUTTER AND JELLY ICE CREAM. Be still, my heart. It is my favorite thing in the world. I'm always so sad when I hit the bottom of the cup. I can never have enough of Lula's pb&j ice cream. Never. I'm considering relocating to the East Village just so I can drop by whenever I want. Probably a bad idea. All of that being said, I had a very pb&j day yesterday. 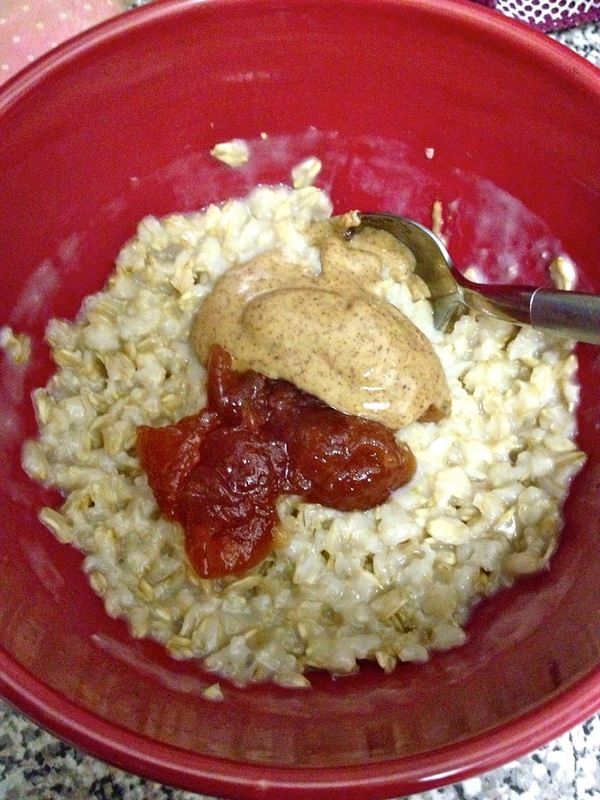 Pre-run meal: pbj (abj) oatmeal. 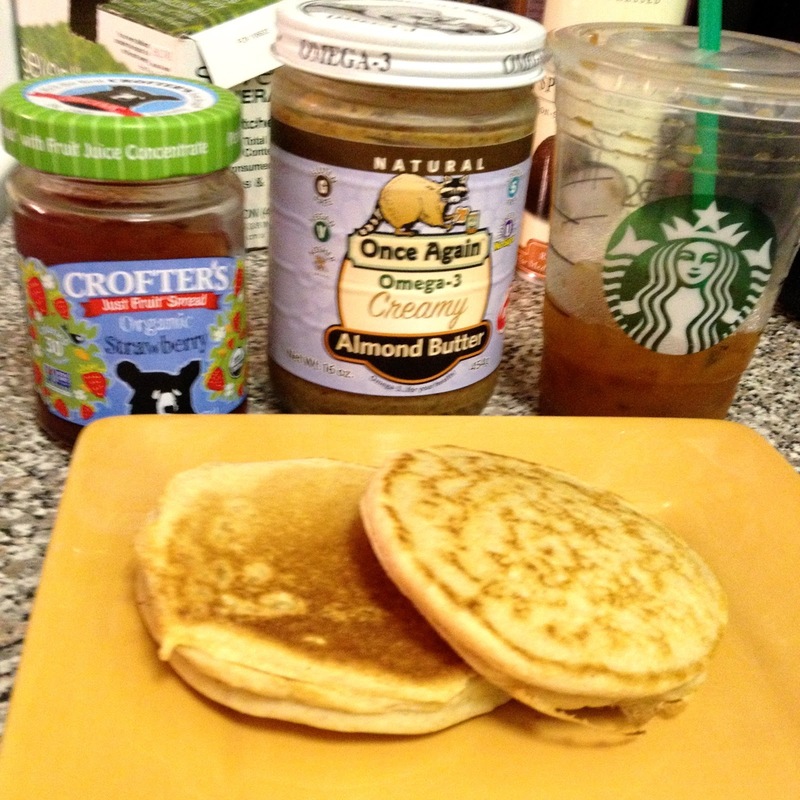 My BFFs, Bob's GF Pancakes, and SBUX! 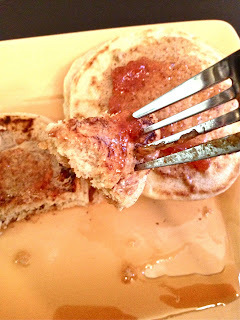 These little nuggets were smeared with AB&J and dipped in maple syrup. It is worth noting that I stole my Sbux order from one of my favorite bloggers, Tina from Carrots 'n' Cake. If you haven't checked her out, you're making a mistake. Leave her some love for me. We bloggers love comments. So, my new Sbux order is a Grande Decaf Americano with one pump pumpkin spice juice and room for milk. That is the LONGEST order I've ever heard. Please tell me if you have a longer one. Then maybe I won't feel so high maintenance. I added almond milk when I got home. 'Twas perfection. Welp, that's all I have for today. 'Till next time, have fun being bad. I'm Tiffany, a 20-something New Yorker getting hungrier by the minute. Follow along, will you?